Somewhere along the Appalachian Trail where the Blue Ridge Mountains straddle the border of eastern Tennessee and western North Carolina, there is a distant rumbling of psychedelic noise echoing through the canyons. It is a sound that has been heard in those parts for damn near ten years, but as of recently, it is one that has been growing and becoming more prevalent on a global scale. The sound is a dichotic mosaic of nature’s soothing majesty and metal’s jarring and abrasive power. It is the music of a collective known as U.S. Christmas (USX). Now you may know them from recent high profile gigs with Baroness…and you probably heard their previous album Run Thick in the Night since it was arguably the best stoner/doom release of 2010. But on their latest record, The Valley Path, USX has decided to challenge their listeners in a way that some bands have attempted, but in which very few have been successful. You see, The Valley Path is in fact one…epic…song. At the risk of speaking for the band, I won't try and explain why they decided to eschew traditional song structures, opting instead to string each musical movement together with continuous guitar notes or in some cases simply the sounds of the wilderness to create one, long, uninterrupted listening session. But the fact is there are no fewer than five…maybe even six places within the album where the music shifts or moves if you will, becoming essentially a new song. Instead, USX uses a variety of techniques to connect these pieces and in the end we're left with the lone, gargantuan track clocking in at just under 40 minutes. Vocalist/guitarist Nate Hall offers some insight into this decision saying that “a song does not have to be a part of a collection. It is more important for music to take the path it chooses, and an artist must be willing to let this happen. The Valley Path is one song. And a song is a thing that changes.” So now that you understand what you're in for, let's get down to the business at hand…is it any good? Well I'll be honest, this is a meandering piece of music that will likely take multiple listens to "get it". As I gave The Valley Path a second run through…and then a third…and a fourth, I began to discover things I'd missed on my first journey through the album. For starters, as I've already mentioned, it is really made up of five distinct musical ventures and a number of interludes that are all interconnected. The first of these begins with the early morning sounds of birds singing and crickets chirping before a few guitar notes join the mix…but the guitar doesn't so much as overcome the sounds of nature as it plays alongside them…like they too are an instrument of the band. Eventually the bass and drums enter the picture slowly…steadily…and we hear Hall's lazy drawl…"there is a time for wicked redemption". That initial, trance inducing guitar part carries on for the next ten minutes, driving the music through a series of guitar solos and our first taste of Meghan Mulhearn's excellent violin playing, which adds a perfectly ethereal touch to the USX sound. This all flows into the first sort of interlude, this one consisting of strummed guitar, gentle violin and ambient noise. 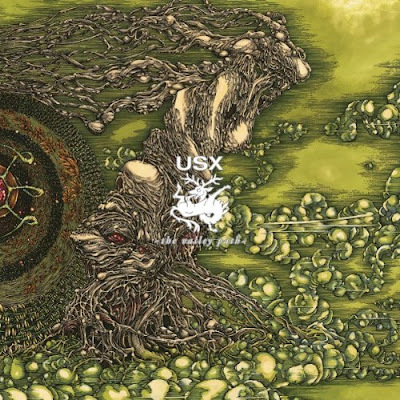 And just as your mind begins to wander and you've been lulled into a hypnotic state, USX hits you with a fantastic riff and for the first time, we hear the full band jamming together in unison. And to hear these guys incorporate every instrument in their arsenal at once is a treat for the ears because there are seven band members and each one is contributing in their own way. You'll hear multiple guitars, dual drummers, what sounds like an organ and of course that magnificent violin permeating through all of it. This span of The Valley Path from around the fourteen minute mark to the nineteenth minute may just be my favorite part. It is heavy, it is beautiful and when you find it buried within the overall piece of music, it's like discovering a hidden treasure for the ears. The next phase of the album returns us to the woods, to the gentle sounds of nature…perhaps now it's midday. The band makes their presence known, but only through subtle soundscapes and atmospheric noises in the background. At one point you'll even hear a train passing by somewhere off in the distance…or maybe I just imagined that to be the case…because that's what it's like listening to The Valley Path…you're eyes will glaze over and your mind will take a trip without your body. And then just when you give in to the peacefulness you're hearing and the images and memories that its conjuring inside of you…a guitar jolts you back to reality…and then a cymbal…and that violin…USX returns and this is where The Valley Path becomes epic. The section from around the twenty-one and a half minute mark to the twenty-sixth minute is absolutely arresting…a full orchestra couldn't produce beautiful noise such as this. Another minute or so passes by…white noise…nothingness…and then…familiarity…the opening guitar notes that started this whole dramatic piece of music returns. Thunderous drums follow close on its heels…and finally Hall's murmured vocals return. This reprise of sorts guides us…drives us…leading us…where? To the conclusion. The beginning of the end of this musical saga takes place at around the thirty-four minute mark, where USX unleashes the full force of their musical capabilities for the second time and the impact on your eardrums is absolutely monumental. Words cannot describe that sound, you just need to hear it. And when the final echoes of feedback drain out of the speakers, we find that we've been dropped off right back where we started at the beginning of The Valley Path…only things are different…time has passed…gone are the sounds of early birds getting their worms…this is the sound of evening…toads croaking and crickets drowning out the day…this is the end. So to answer the question of whether or not this album is any good…I would say emphatically…yes! However, you do need to understand that it is a challenging listen. You cannot digest The Valley Path in pieces, no matter how tempting it may be…it must be taken whole…USX has designed it that way intentionally. This is not the album you'll go to when you want to blare something from your car stereo with the windows rolled down. This is the album you'll turn to when hope seems lost and you just need time alone with your thoughts. This is a headphone album. It is sweeping in scope, and although it will require patience, the payoff is there…it is rewarding and quite honestly…it is enlightening.